The weather has been crazy the past month or so but it looks like Spring is finally here. This past Friday was my off-day so I spent it running around taking care of a few things. Post office drop-off, a trip to the landfill and then an invite to lunch with Shelby and her co-workers. I'm kind of the of the lunch mascot for those guys, I always show up when they go out. We went to Whitner's Barbeque in Virginia Beach, it's near Lynnhaven Mall. It's been there for a while now and I've actually had a BBQ sandwich from the shop once or twice before. Shelby and I ended up sharing a three meat sampler that had pulled pork, beef brisket, and "wet" ribs. We had a little mac 'n cheese and dirty rice too. 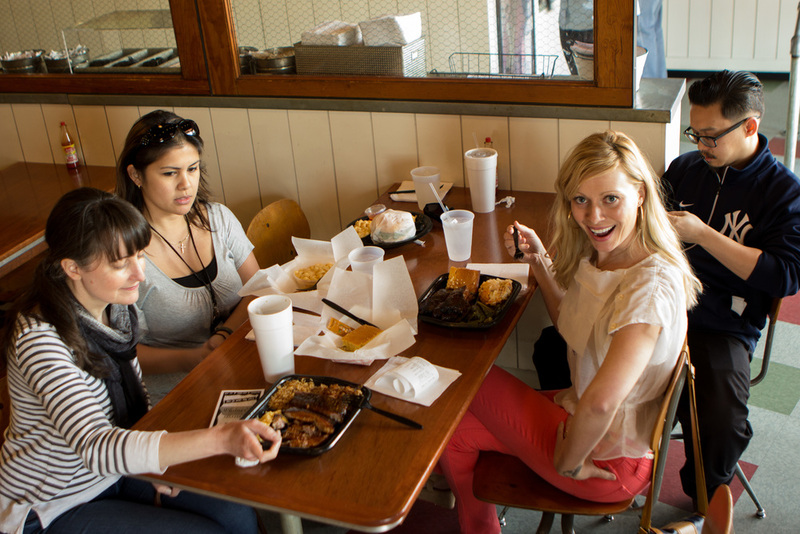 Shelby really liked the brisket and I enjoyed the ribs, but all three BBQ meats were good. I didn't care a lot for the mac 'n cheese, it was a little bland, the dirty rice was tasty though. After dropping off Shelby I made run to Norfolk to pick-up a stack of HR Growlers for my mother's barber shop Town Center Barber Shop near Pembroke. I made my way back to hit Back Bay Brewing, I was hoping to meet up with Josh Canada, one of the founders of the brewery to talk a little bit about their new tasting room. The weather was great down at the Oceanfront, people were out and a lot of the shops had their doors open to let the fresh air in. After I parked I walked around and saw Nick and Victoria hanging out in front of Zeke's Beans & Bowls. Nick is one the owners of Zeke's that specializes in poke bowls and coffee--you probably figured that out by the name. If you're at the Beach, it's a must try. I love the bowls there. After chatting with them a bit I walked into the Back Bay, which is right next door. Dan (chief brewer at Back Bay) was in talking to Ariel from Hoffman Beverage at the bar. I chatted with them a bit and then asked about seeing Josh, I was told he was in a conference call and would be right out to see me afterwards. I hung out a bit and talked some more, I eventually had to leave though because I wanted to make sure I could pick up Shelby from work. It was Friday and I'm sure she was ready for the weekend. We stopped home and I ended up running out for wine tasting. Friday nights are wine tasting nights for me. I visited Yiannis Wine Shop and Grape and Gourmet. I bumped into an old friend at Grape and Gourmet, David Sorey. We grew up together in the same neighborhood and have known each other since elementary school. My Friday routine usually ends with me picking up sushi next door. So, of course, I swung by Misako for a take-out and chatted with Mr. Teng and Tammy for a little bit. I've told you this before, but they have a roll named after me there! The George Roll--it's good, seriously. I gathered the wine, sushi, and camera and headed home after Misako. Shelby and I enjoyed picking through the hot and sushi bar box I brought home and opened up a good tempranillo.